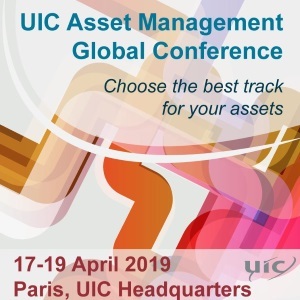 The Asset Management Working Group of the International Union of Railways (UIC) is organising its fourth international Conference dedicated to Asset management, in Paris at UIC Headquarters, from 17th to 19th April 2019.
exploring the latest developments, knowledge and experience across the Asset Management World. 10:00 am: Welcome address and division of the participants in 3 groups who can attend each of the three 40-minute sessions. End of the visit: around 12.30. Through the use of ASSETSGAME, participants learn in one day how an Asset Management programme benefits an organization and the changes that are needed to achieve success. Please note exhibition booths and sponsoring opportunities will be offered on a first come first served basis. To make a bank transfer in the payment panel, please click on the link to "Other means of payment". dinner at the Musée du Vin on 17/04/19.